But do its members agree with what that “voice” is saying? Every year, Council 31, its political action committee, and its national counterpart, AFSCME headquarters,2 funnel millions of dollars to political candidates and causes. Unfortunately, it’s difficult – if not impossible – for members to know exactly where that money goes. And unless members spend days combing through hundreds of pages of federal and state reporting documents, they will never know. AFSCME counts on that. The complexity of spending reporting allows union leadership to clandestinely direct funds to politicians and to causes its members may oppose. First, filings with the Illinois State Board of Elections reveal Council 31’s PAC spent more than $6.8 million on political causes and candidates for office in Illinois in 2013 through 2017. Of that amount, almost $2.8 million was directed toward the election committees of current state lawmakers. The PAC’s political spending reveals a number of findings. For example, at least 74 percent of its overall political spending in Illinois over the five-year period between 2013 and 2017 was directed to Democrats, such as House Speaker Mike Madigan. 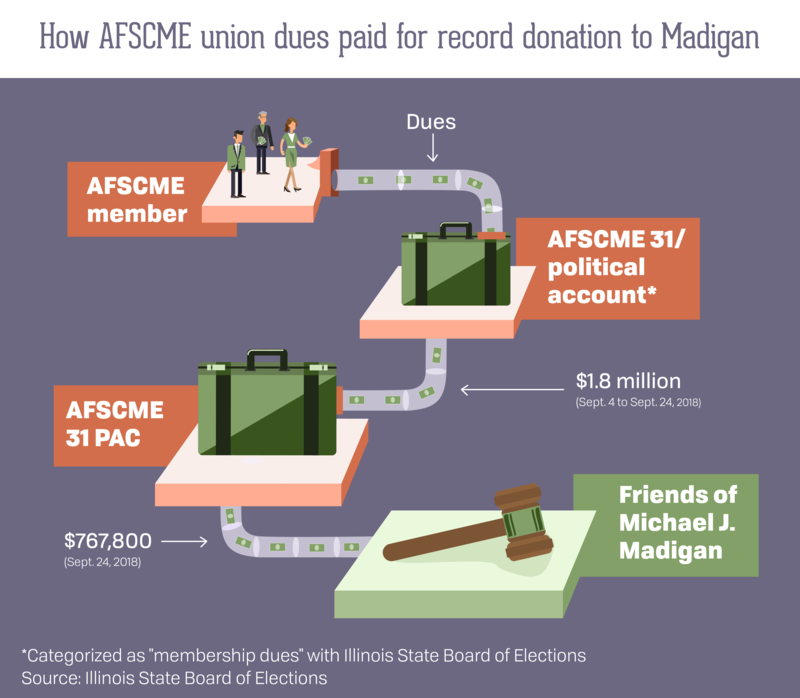 In fact, in his role as chairman of multiple political funds, Madigan was the top recipient of AFSCME political spending from 2013 to 2017 – receiving more than $541,000. That spending spikes in election years, when the union is particularly committed to getting Democrats elected. And a whopping 104 of the current 177 state lawmakers – or nearly 3 in 5 – received money from Council 31’s PAC. Second, federal reporting documents reveal that Council 31 spent more than $7.7 million on political activities and lobbying from 2013 to 2017 – but lax reporting requirements allow the union to hide the full array of its political spending. AFSCME doesn’t have to specifically list all political activities or lobbying it financially supports. 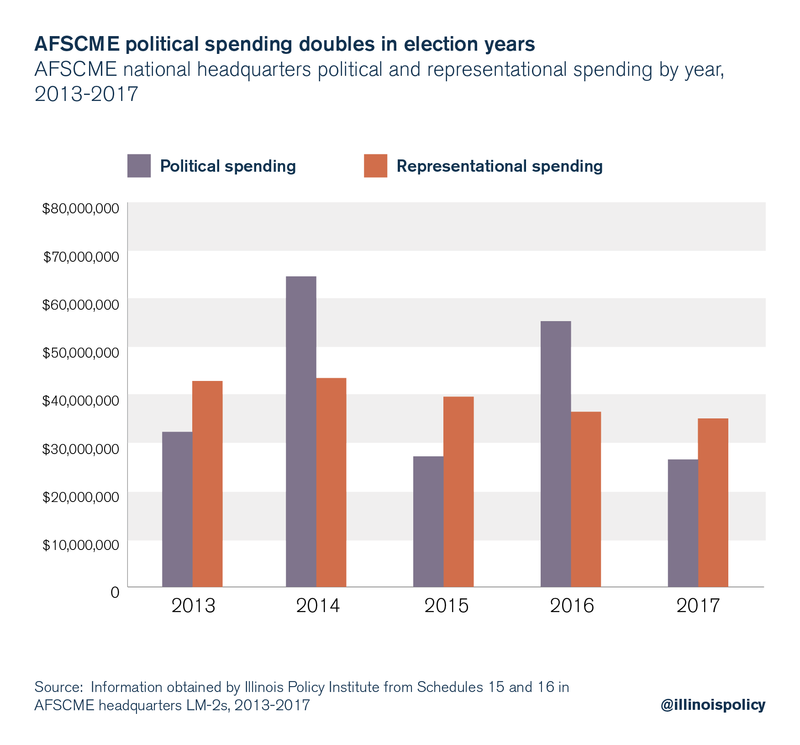 In fact, the bulk of AFSCME’s political spending is on political activities and lobbying performed by its officers and employees – but the union does not have to list in what political activities or lobbying those officers or employees participated. Furthermore, AFSCME has a lot of leeway in what it must categorize as “political” spending, and can thereby downplay how much money it actually directs to political activities. Finally, federal reporting documents reveal AFSCME headquarters spent more than $205 million on political activities and lobbying from 2013 to 2017. That spending was spread across the United States to politicians, organizations and political committees. Because all members of Council 31 are also members of AFSCME headquarters, a portion of their dues is directed to the union at the national level – and, therefore, to the political activities the headquarters supports. These state and federal reporting documents reveal the majority of AFSCME political spending favors Democrats and left-leaning, progressive committees and organizations. Considering that polling reveals roughly 40 percent of union households have voted Republican in every presidential election since 2000,4 AFSCME’s priorities appear at odds with the political leanings of a significant percentage of its members, who have no voice in how union leadership spends their hard-earned money. That changes following the U.S. Supreme Court’s June 2018 decision in Janus v. AFSCME. Following that decision, government workers represented by AFSCME can decide for themselves whether to fund the union and its political activities. They simply need to opt out of their unions and tell their employers to stop deducting union fees from their paychecks. Council 31 doesn’t make it easy to track its money trail. It shuffles money derived from membership dues from one affiliated account or organization to another. 74 percent of the PAC’s political spending was directed toward Democrats, with Republicans receiving only 6 percent. 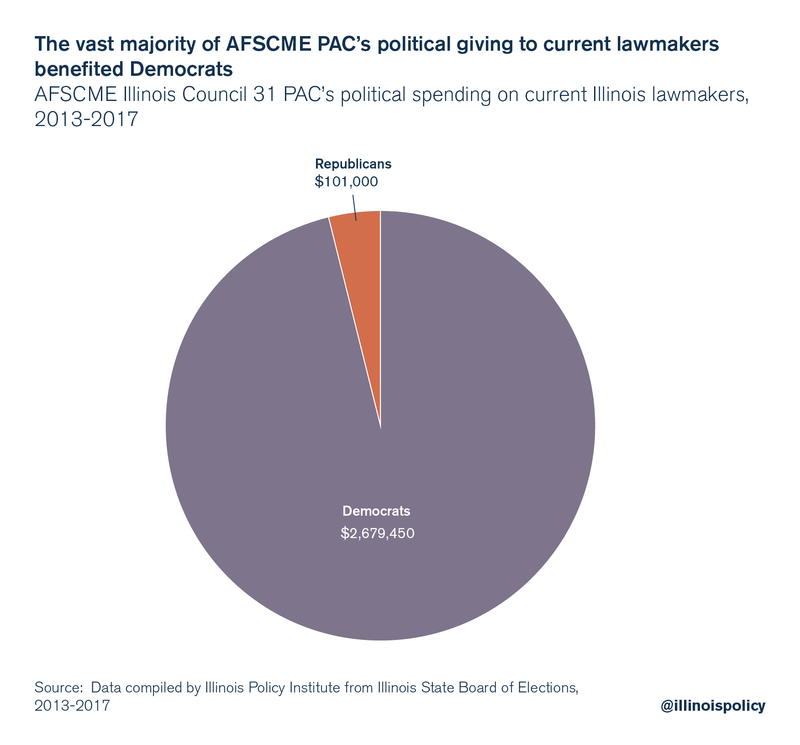 House Speaker Mike Madigan – through the campaign committees he controls – was the top recipient of AFSCME Council 31 political spending, receiving more than $541,000. The PAC’s political spending spikes in election years. The PAC spent almost $2.8 million in the past five years on current state lawmakers, with more than $2.6 million (96 percent) going to Democrats. 104 of 177 current lawmakers have received money from AFSCME’s PAC – including 88 percent of current Democratic lawmakers. Not all AFSCME members agree with those spending priorities. Nonetheless, their dues money is directed wherever Council 31’s leadership wants it to go. A look at the top 10 recipients of the PAC’s political spending reveals the union’s political preferences: It spends big on big-name Democrats. 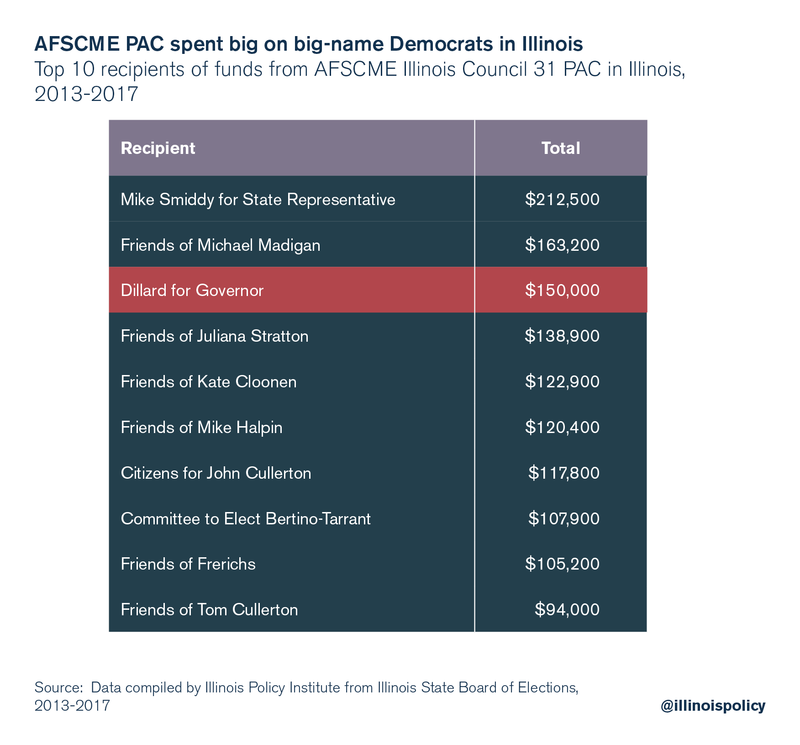 The top recipient of AFSCME’s political funding between 2013 and 2017 was Illinois House Speaker Mike Madigan. Between his campaign committee (Friends of Michael Madigan), the Democratic Party of Illinois (which Madigan chairs) and Democratic Majority (which Madigan also chairs), the speaker took in more than $541,000 from Council 31 during that time. Of course, this total would not include funds Council 31 sent directly to other Democratic lawmakers backed by the speaker, at his direction. AFSCME’s PAC spent millions on the election committees of current state lawmakers who, once elected, made important decisions on labor policy, pensions and other matters affecting both the union and taxpayers. 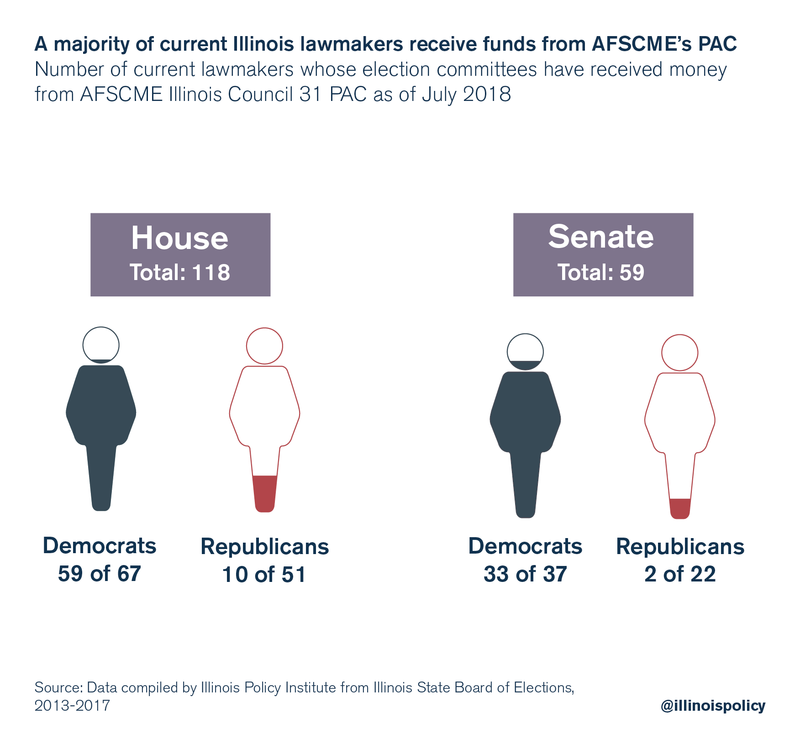 AFSCME’s PAC has donated money to more than half of current lawmakers in the Illinois General Assembly. Of the current 177 sitting lawmakers, the election committees of 104 received funding in the past five years. That means AFSCME’s PAC provided funding to the election committees of large numbers of lawmakers tasked with making decisions about legislation affecting the union. 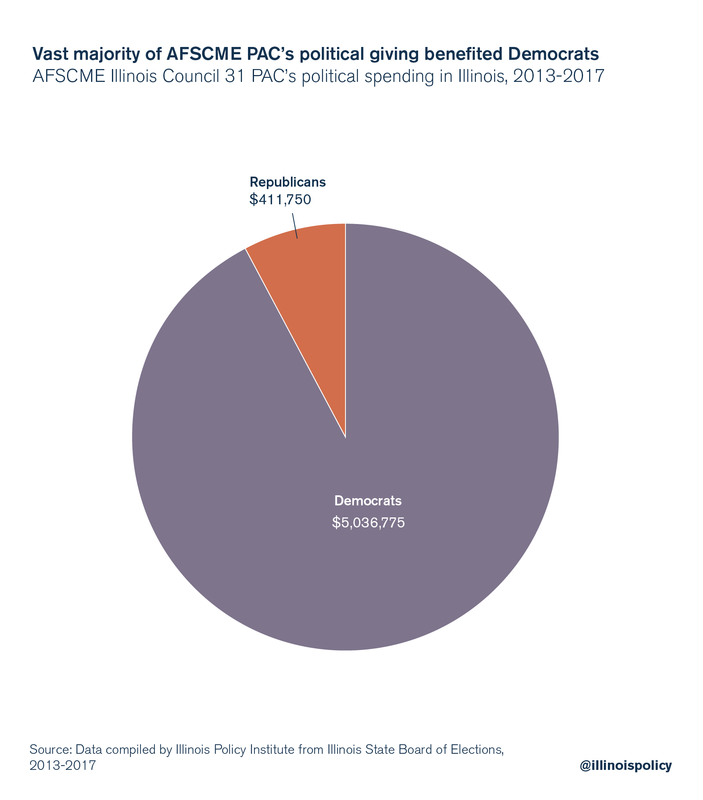 The overall picture is clear: AFSCME spends big on Democrats. Union members’ dues fund that political agenda – regardless of their own political preferences. But those documents are cumbersome and don’t tell the whole story. As a result, AFSCME can keep its members in the dark on its political spending. These schedules are intended to categorize the money the union spent. In theory, that would allow members to see how the union is using their dues money. But there are loopholes. First, most of Council 31’s political spending is not itemized – meaning members can’t know what political causes the union supports. That’s because the bulk of Council 31’s political spending is on political activities and lobbying by its officers and employees – and the union doesn’t have to report in what political activities or lobbying those officers or employees participated. Second, Council 31 has considerable discretion in how it categorizes its spending. 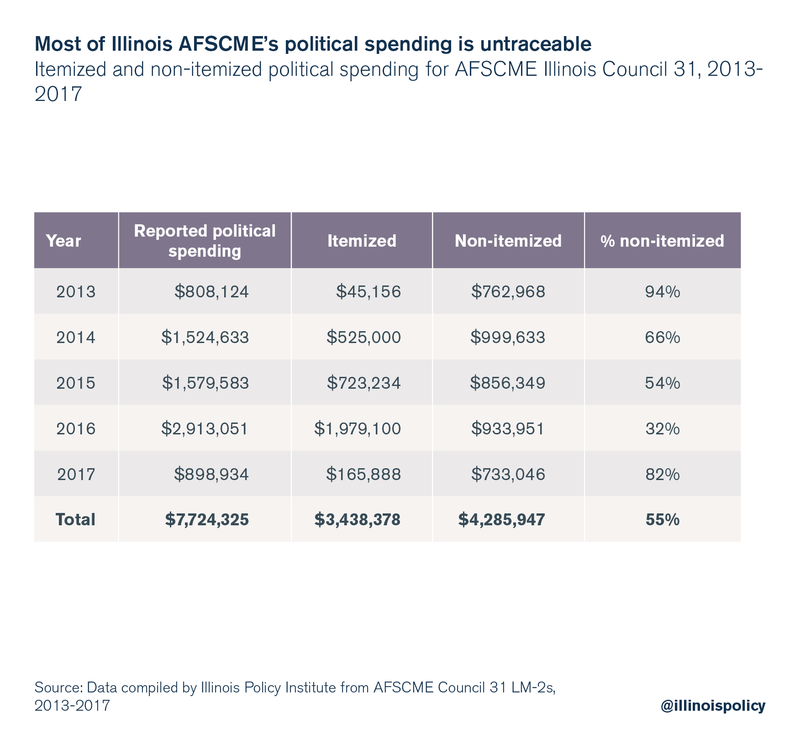 While spending may look political to the average person, AFSCME can characterize it as something else and place it on a different LM-2 schedule. That skews its total reported political spending downward. Most of Council 31’s political spending is on activities or lobbying performed by its officers and employees – but there is no way to tell in what political activities or lobbying these workers participated. A look at Council 31’s 2017 LM-2 demonstrates how this works – and how impossible it is for members to know where most of Council 31’s political efforts are directed. That means $733,046 in political spending – approximately 82 percent of the union’s reported political spending in 2017 – was not itemized in Schedule 16. Where did that money go? One might look to Schedules 11 (All Officers and Disbursements to Officers) and 12 (Disbursements to Employees) to determine how this money was spent, but key details are missing. Schedules 11 and 12 list all officers and employees of the union and their salary information. Along with the salary information is a breakdown of how those officers and employees spent their time – e.g., the percentage of time (salary) they spent on representational activities, political activities and lobbying, contributions, general overhead, and administration. Unfortunately, there is no way for members to know in what political activities those Council 31 staff members participated. They could have been lobbying for certain legislation, fundraising for Democratic candidates or engaging in other forms of politicking. That’s the norm for Council 31. Of the $7.7 million the union reported spending on political activities and lobbying between 2013 and 2017, more than $4.2 million was directed toward the political activities and lobbying of officers and staff, in addition to other nonitemized disbursements.31 That means the direction of more than half of Council 31’s political expenses in the past five years is completely unknown. Exactly where was that political spending directed? Council 31 isn’t saying. And its members have no way of knowing. Council 31 has substantial discretion in determining how it characterizes the money it spends. While some spending may be political in nature, the union can categorize it differently, thereby downplaying the total amount of money it spends on politics and lobbying. As previously discussed, LM-2s are divided into different categories, or schedules. In each schedule, the union is to list spending related to the schedule topic. That’s not “overhead.” That’s politics. Similarly, Council 31 listed some contributions or gifts it made to inherently political organizations in a separate schedule – “Schedule 17 – Contributions, Gifts, and Grants” – instead of in the schedule on political activity. For example, between 2013 and 2016, the union directed more than $443,000 to Citizen Action Illinois, which describes itself as “leading the way in the fight for the progressive agenda.”42 Yet that spending is not listed by the union as political activity. Altogether, Council 31’s utilization of the LM-2 form’s lax standards allows the union to spend money for political purposes without a full accounting to its members. AFSCME members don’t just pay dues to AFSCME Council 31. They also pay dues to AFSCME headquarters, which spends millions of dollars each year on political causes and candidates. Between 2013 and 2017, AFSCME headquarters reported spending more than $205 million on political activities and lobbying.43 That spending was spread across the United States to a number of different politicians, political organizations and Democratic committees from the local to the national level. Like Council 31, AFSCME headquarters’ political spending leaned heavily Democratic. For example, between 2013 and 2017 the union gave more than $3.6 million to Senate Majority PAC44 and House Majority PAC,45 which exist to help Democrats win seats in the U.S. Senate and U.S. House of Representatives, respectively.46 At the state level, AFSCME gave more than $3.2 million to the Democratic Legislative Campaign Committee,47 which is committed to getting local Democrats elected to statehouses across the nation.48 AFSCME headquarters’ 2013-2017 LM-2s do not reveal any funding going to any similar organizations of other political parties. Council 31, its PAC and AFSCME headquarters are major political players, funneling millions of dollars every year to Democrats or self-proclaimed progressive organizations. That’s fine – if members agree with the way that money is spent. Clearly, there is a misalignment between the priorities of AFSCME leadership and those of many of the workers it purports to represent. Union members upset with AFSCME’s political priorities are not without redress. While they cannot dictate how their union dues are spent, now they can decide whether the union gets their money at all. To best make that decision, union members should be equipped with the facts on what AFSCME spends, and what it hides. A union is free to spend member dues on political activities, such as directing money to its political action committee. See, e.g., Philip Bump, “Donald Trump got Reagan-like Support from Union Households,” Washington Post, November 10, 2016. AFSCME Council 31, 2016 LM-2 (reporting $1,836,478 to AFSCME Illinois Council 31 Political Account); AFSCME Council 31, 2015 LM-2 (reporting $654,235 to AFSCME Illinois Council 31 Political Account); AFSCME Council 31, 2014 LM-2 (reporting $525,000 to AFSCME Illinois Council 31 Political Account). 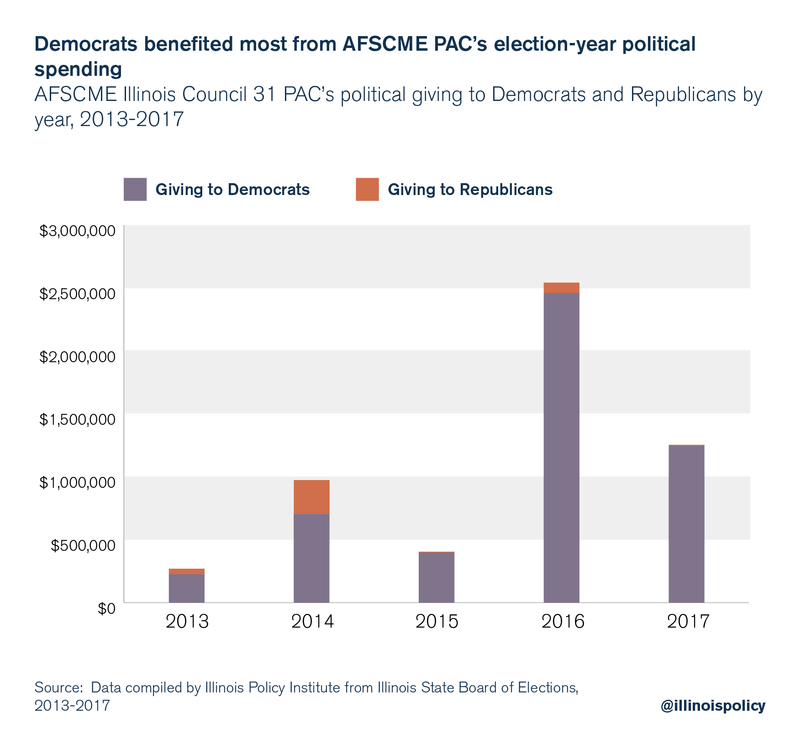 Data obtained by Illinois Policy Institute from the Illinois State Board of Elections demonstrate that AFSCME’s PAC directed at least $6,806,091 to election committees and other political action committees in Illinois from 2013 to 2017. Data obtained by Illinois Policy Institute from the Illinois State Board of Elections, 2013-2017. Examples include Illinois Freedom PAC, which received at least $880,000 in 2014 from the PAC; Illinois Legislative Black Caucus and Illinois Legislative Black Caucus Foundation, which received at least $27,000 in 2013-2017 from the PAC; and Working Illinois Political Action Committee, which received at least $25,000 in 2014 from the PAC. Data obtained by Illinois Policy Institute from the Illinois State Board of Elections, 2013-2017. Smiddy’s election committee received at least $45,000 in 2013, at least $60,700 in 2014 and at least $106,800 in 2016 from the PAC. Data obtained by Illinois Policy Institute from the Illinois State Board of Elections, 2013-2017. Madigan’s election committee received at least $107,800 from the PAC in 2016 and at least $55,400 from the PAC in 2017. Data obtained by Illinois Policy Institute from the Illinois State Board of Elections, 2013-2017. John Cullerton’s election committee received at least $107,800 from the PAC in 2016 and at least $10,000 from the PAC in 2014. Data obtained by Illinois Policy Institute from the Illinois State Board of Elections, 2013-2017. Dillard’s election committee received at least $150,000 from the PAC in 2014. Data obtained by Illinois Policy Institute from the Illinois State Board of Elections, 2013-2017. The Democratic Party of Illinois was the second leading recipient of the PAC’s political funds between 2013 and 2017. It was second only to Illinois Freedom PAC, an anti-Rauner PAC that received at least $880,000 in 2014 from Council 31’s PAC. Data obtained by Illinois Policy Institute from the Illinois State Board of Elections, 2013-2017. Democratic election committees received at least $225,890 in 2013, $704,780 in 2014, $398,260 in 2015, $2,461,175 in 2016 and $1,246,670 in 2017. Republican election committees received at least $44,550 in 2013, $269,800 in 2014 (at least $150,000 of which went to the election committee of Kirk Dillard), $7,250 in 2015, $82,150 in 2016 and $8,000 in 2017. Data obtained by Illinois Policy Institute from the Illinois State Board of Elections, 2013-2017. Current Democratic lawmakers received at least $2,679,450 from the PAC between 2013 and 2017. Data obtained by Illinois Policy Institute from the Illinois State Board of Elections, 2013-2017. Current Republican lawmakers received only $101,000 from the PAC between 2013 and 2017. Data obtained by Illinois Policy Institute from the Illinois State Board of Elections, 2013-2017. There are 104 Democratic lawmakers in the General Assembly. See Illinois General Assembly, “Current Senate Members,” (denoting 37 Senate Democrats); Illinois General Assembly, “Current House Members,” (denoting 67 House Democrats). Council 31’s PAC directed money to 33 Democratic senators and 59 Democratic representatives. Those lawmakers included state Sens. Omar Aquino, Scott Bennett, Jennifer Bertino-Tarrant, Daniel Biss, Melinda Bush, Cristina Castro, James Clayborne Jr., John Cullerton, Tom Cullerton, Bill Cunningham, William Haine, Don Harmon, Napoleon Harris III, Michael Hastings, Linda Holmes, Mattie Hunter, Toi Hutchinson, Emil Jones III, David Koehler, Kimberly Lightford, Terry Link, Andy Manar, Pat McGuire, Julie Morrison, John Mulroe, Antonio Muñoz, Laura Murphy, Kwame Raoul, Martin Sandoval, Ira Silverstein, Elgie Sims Jr., Heather Steans and Patricia Van Pelt, and House Speaker Michael Madigan and state Reps. Carol Ammons, Jaime Andrade Jr., Luis Arroyo, Kelly Burke, Kelly Cassidy, John Cavaletto, Linda Chapa LaVia, Deb Conroy, Melissa Conyears-Ervin, Jerry Costello II, Fred Crespo, Barbara Flynn Currie, John D’Amico, William Davis, Anthony DeLuca, Marcus Evans Jr., Sara Feigenholtz, Laura Fine, La Shawn Ford, Robyn Gabel, Jehan Gordon-Booth, LaToya Greenwood, Will Guzzardi, Michael Halpin, Sonya Harper, Gregory Harris, Elizabeth Hernandez, Jay Hoffman, Frances Ann Hurley, Thaddeus Jones, Stephanie Kifowit, Lou Lang, Theresa Mah, Natalie Manley, Robert Martwick, Rita Mayfield, Christian Mitchell, Anna Moeller, Martin Moylan, Michelle Mussman, Al Riley, Robert Rita, Sue Scherer, Carol Sente, Justin Slaughter, Cynthia Soto, Juliana Stratton, Katie Stuart, Silvana Tabares, André Thapedi, Arthur Turner, Litesa Wallace, Lawrence Walsh, Jr., Emanuel Chris Welch, Ann Williams, Kathleen Willis, Sam Yingling and Michael Zalewski. Data obtained by Illinois Policy Institute from the Illinois State Board of Elections, 2013-2017. There are 73 Republican lawmakers in the General Assembly. See Illinois General Assembly, “Current Senate Members,” (denoting 22 Senate Republicans); Illinois General Assembly, “Current House Members,” (denoting 51 House Republicans). Council 31’s PAC directed money to two Republican senators and 10 Republican representatives. Those lawmakers included state Sens. Neil Anderson and Sam McCann and state Reps. John Cabello, C.D. Davidsmeyer, Mike Fortner, Norine Hammond, Chad Hays, Michael McAuliffe, Bill Mitchell, Robert Pritchard, David Reis and Mike Unes. Data obtained by Illinois Policy Institute from the Illinois State Board of Elections, 2013-2017. AFSCME Council 31, 2017 LM-2 (reporting $898,934 on Schedule 16, Political Activities and Lobbying); AFSCME Council 31, 2016 LM-2 (reporting $2,913,051 on Schedule 16, Political Activities and Lobbying); AFSCME Council 31, 2015 LM-2 (reporting $1,579,583 on Schedule 16, Political Activities and Lobbying); AFSCME Council 31, 2014 LM-2 (reporting $1,524,633 on Schedule 16, Political Activities and Lobbying); AFSCME Council 31, 2013 LM-2 (reporting $808,124 on Schedule 16, Political Activities and Lobbying). AFSCME Council 31, 2016 LM-2 (reporting $1,836,478 on Schedule 16, Political Activities and Lobbying , to AFSCME Illinois Council 31 Political Account); AFSCME Council 31, 2015 LM-2 (reporting $654,235 on Schedule 16, Political Activities and Lobbying, to AFSCME Illinois Council 31 Political Account); AFSCME Council 31, 2014 LM-2 (reporting $525,000 on Schedule 16, Political Activities and Lobbying, to AFSCME Illinois Council 31 Political Account). United States Department of Labor, “Reports required under the LMRDA and the CSRA.” Only unions representing private employees, U.S. Postal Service employees or most federal government employees must file an LM-2. While AFSCME is the largest government worker union in Illinois, it must file an LM-2 because it also represents workers in the private sector. See United States Department of Labor, “Instructions for form LM-2 labor organization annual report,” November 2010. AFSCME Council 31, 2017 LM-2 (reporting $898,934 on Schedule 16, Political Activities and Lobbying). The combined total of these disbursements is $165,888 of the $898,934 reported on Schedule 16, Political Activities and Lobbying. Thus, Council 31 spent $733,046 on political activities and lobbying that was not individually reported. Council 31’s LM-2 only accounts for the salary provided to Lynch from Council 31 itself. Her overall earnings are not reflected in the LM-2. For example, she also received an additional $16,800 from AFSCME headquarters in 2017. See AFSCME headquarters, 2017 LM-2 (reporting $16,800 to Roberta Lynch on Schedule 11, All Officers and Disbursements to Officers). Council 31 spent $15,019 on the political activities/lobbying of its officers, and $718,027 on the political activities/lobbying of its other employees. See Council 31, 2017 LM-2 (Detailed Summary Page – Schedules 14-19). Ibid. (Detailed Summary Page – Schedules 14-19). AFSCME Council 31, 2017 LM-2 (reporting $102,730 on publication of and $105,000 on postage for “On the Move” in Schedule 18, General Overhead); AFSCME Council 31, 2016 LM-2 (reporting $105,023 on publication of and $126,000 on postage for “On the Move” in Schedule 18, General Overhead); AFSCME Council 31, 2015 LM-2 (reporting $128,627 on publication of and $126,000 on postage for “On the Move” in Schedule 18, General Overhead); AFSCME Council 31, 2014 LM-2 (reporting $129,445 on publication of and $118,800 on postage for “On the Move” in Schedule 18, General Overhead); AFSCME Council 31, 2013 LM-2 (reporting $128,855 on publication of and $108,420 on postage for “On the Move” in Schedule 18, General Overhead). See, e.g., AFSCME Council 31, On the Move, (January-February 2018). AFSCME Council 31, On the Move, (January-February 2018). AFSCME Council 31, On the Move, (September-October 2016). See AFSCME Council 31 2014 LM-2 (categorizing 5 percent of work by David Miller, editor of “On the Move,” as “political activities and lobbying”); AFSCME Council 31 2013 LM-2 (categorizing 5 percent of work by Lincoln Cohen, editor of “On the Move,” as “political activities and lobbying”). AFSCME Council 31 2016 LM-2 (reporting $34,618 for “Stop Rauner Ads” on Schedule 15, Representational Activities). See also Mailee Smith, “AFSCME blurs the lines between “representational” and “political” spending, to the detriment of fair share payers”, Illinois Policy Institute, April 5, 2017. AFSCME Council 31 2017 LM-2 (reporting $6,808 for “We Support State Workers” signs on Schedule 15, Representational Activities); AFSCME Council 31 2016 LM-2 (reporting $26,850 for “Support State Workers” signs on Schedule 15, Representational Activities). AFSCME Council 31 2016 LM-2 (reporting $5,400 for “Charter buses for 5/18 rally” on Schedule 15, Representational Activities). See also Mailee Smith, “3 key takeaways from the May 18 union rally in Springfield”, Illinois Policy Institute, May 19, 2016. AFSCME Council 31, 2016 LM-2 (reporting $13,500 to Citizen Action Illinois on Schedule 17, Contributions, Gifts & Grants); AFSCME Council 31, 2015 LM-2 (reporting $100,000 to Citizen Action Illinois on Schedule 17, Contributions, Gifts & Grants); AFSCME Council 31, 2014 LM-2 (reporting $220,000 to Citizen Action Illinois on Schedule 17, Contributions, Gifts & Grants); AFSMCE Council 31, 2013 LM-2 (reporting $110,000 to Citizen Action Illinois on Schedule 17, Contributions, Gifts & Grants). No funds were reported directed toward Citizen Action Illinois were reported on the 2017 LM-2. See also Citizen Action Illinois. AFSCME headquarters, 2017 LM-2 (reporting $26,506,599 on Schedule 16, Political Activities and Lobbying); AFSCME headquarters, 2016 LM-2 (reporting $55,286,734 on Schedule 16, Political Activities and Lobbying); AFSCME headquarters, 2015 LM-2 (reporting $27,163,272 on Schedule 16, Political Activities and Lobbying); AFSCME headquarters, 2014 LM-2 (reporting $64,585,115 on Schedule 16, Political Activities and Lobbying); AFSCME headquarters, 2013 LM-2 (reporting $32,249,694 on Schedule 16, Political Activities and Lobbying). Total reported spending by AFSCME headquarters on political activities and lobbying in 2013-2017 was $205,791,414. AFSCME headquarters, 2017 LM-2 (reporting $500,000 on Schedule 16, Political Activities and Lobbying); AFSCME headquarters, 2015 LM-2 (reporting $250,000 on Schedule 16, Political Activities and Lobbying); AFSCME headquarters, 2014 LM-2 (reporting $250,000 on Schedule 16, Political Activities and Lobbying); AFSCME headquarters, 2013 LM-2 (reporting $250,000 on Schedule 16, Political Activities and Lobbying). Total reported giving in 2013-2017 to Senate Majority PAC was $1,250,000. AFSCME headquarters, 2017 LM-2 (reporting $250,000 on Schedule 16, Political Activities and Lobbying); ASFCME headquarters, 2016 LM-2 (reporting $1,300,000 on Schedule 16, Political Activities and Lobbying); AFSCME headquarters, 2015 LM-2 (reporting $150,000 on Schedule 16, Political Activities and Lobbying); AFSCME headquarters, 2014 LM-2 (reporting $450,000 on Schedule 16, Political Activities and Lobbying); AFSCME headquarters, 2013 LM-2 (reporting $250,000 on Schedule 16, Political Activities and Lobbying). Total reported giving in 2013-2017 to House Majority PAC was $2,400,000. AFSCME headquarters, 2017 LM-2 (reporting $500,000 on Schedule 16, Political Activities and Lobbying); AFSCME headquarters, 2016 LM-2 (reporting $1,000,000 on Schedule 16, Political Activities and Lobbying); AFSCME headquarters, 2015 LM-2 (reporting $250,000 on Schedule 16, Political Activities and Lobbying); AFSCME headquarters, 2014 LM-2 (reporting $900,000 on Schedule 16, Political Activities and Lobbying); AFSCME headquarters, 2013 LM-2 (reporting $625,000 on Schedule 16, Political Activities and Lobbying). Total reported giving in 2013-2017 to Democratic Legislative Campaign Committee was $3,275,000. AFSCME headquarters, 2013-2017 LM-2s (reporting more than $6 million to Democratic Governors Association, Democratic Lieutenant Governors Association, Democratic Attorneys General Association, Democratic Association of Secretaries of State, National Democratic County Officials, National Conference of Democratic Mayors and Democratic Municipal Officials). AFSCME headquarters, 2017 LM-2 (reporting $250,000 on Schedule 16, Political Activities and Lobbying); AFSCME headquarters, 2015 LM-2 (reporting $600,000 on Schedule 16, Political Activities and Lobbying); AFSCME headquarters, 2014 LM-2 (reporting $4,275,000 on Schedule 16, Political Activities and Lobbying); AFSCME headquarters, 2013 LM-2 (reporting $375,000 on Schedule 16, Political Activities and Lobbying). Total reported giving in 2013-2017 to the Democratic Governors Association was $5,500,000. AFSCME headquarters, 2014 LM-2 (reporting $25,000 on Schedule 16, Political Activities and Lobbying); AFSCME headquarters, 2013 LM-2 (reporting $25,000 Schedule 16, Political Activities and Lobbying). Total reported giving in 2013-2017 to the Democratic Lieutenant Governors Association was $50,000. AFSCME headquarters, 2017 LM-2 (reporting $50,000 on Schedule 16, Political Activities and Lobbying); AFSCME headquarters, 2016 LM-2 (reporting $50,000 on Schedule 16, Political Activities and Lobbying); AFSCME headquarters, 2015 LM-2 (reporting $25,000 on Schedule 16, Political Activities and Lobbying); AFSCME headquarters, 2014 LM-2 (reporting $25,000 on Schedule 16, Political Activities and Lobbying); AFSCME headquarters, 2013 LM-2 (reporting $25,000 on Schedule 16, Political Activities and Lobbying).Total reported giving in 2013-2017 to the Democratic Attorneys General Association was $175,000. AFSCME headquarters, 2014 LM-2 (reporting $25,000 on Schedule 16, Political Activities and Lobbying); AFSCME headquarters, 2013 LM-2 (reporting $25,000 on Schedule 16, Political Activities and Lobbying). Total reported giving in 2013-2017 to Democratic Association of Secretaries of State was $50,000. AFSCME headquarters, 2014 LM-2 (reporting $25,000 on Schedule 16, Political Activities and Lobbying); AFSCME headquarters, 2013 LM-2 (reporting $25,000 on Schedule 16, Political Activities and Lobbying). Total reported giving in 2013-2017 to the National Democratic County Officials was $50,000. AFSCME headquarters, 2017 LM-2 (reporting $25,000 on Schedule 16, Political Activities and Lobbying); AFSCME headquarters, 2014 LM-2 (reporting $25,000 on Schedule 16, Political Activities and Lobbying); AFSCME headquarters, 2013 LM-2 (reporting $10,000 on Schedule 16, Political Activities and Lobbying). Total reported giving in 2013-2017 to the National Conference of Democratic Mayors was $60,000. AFSCME headquarters, 2017 LM-2 (reporting $25,000 on Schedule 16, Political Activities and Lobbying); AFSCME headquarters, 2016 LM-2 (reporting $50,000 on Schedule 16, Political Activities and Lobbying); AFSCME headquarters, 2015 LM-2 (reporting $25,000 on Schedule 16, Political Activities and Lobbying); ASFCME headquarters, 2014 LM-2 (reporting $25,000 on Schedule 16, Political Activities and Lobbying); AFSCME headquarters, 2013 LM-2 (reporting $25,000 on Schedule 16, Political Activities and Lobbying). Total reported giving in 2013-2017 to Democratic Municipal Officials was $150,000. AFSCME headquarters, 2016 LM-2 (reporting $53,900 to Friends of Michael J. Madigan on Schedule 16, Political Activities and Lobbying). Ibid. (reporting $53,900 to Friends of Katie Stuart on Schedule 16, Political Activities and Lobbying). Ibid. (reporting $53,900 to Friends of Mike Halpin on Schedule 16, Political Activities and Lobbying). Ibid. (reporting $53,900 to Friends of Sam Yingling on Schedule 16, Political Activities and Lobbying). Ibid. (reporting $53,900 to Mike Smiddy for State Representative on Schedule 16, Political Activities and Lobbying); AFSCME headquarters, 2014 LM-2 (reporting $50,000 to Mike Smiddy for State Representative on Schedule 16, Political Activities and Lobbying). AFSCME headquarters, 2016 LM-2 (reporting $53,900 to Friends of Kate Cloonen on Schedule 16, Political Activities and Lobbying). Ibid. (reporting $53,900 to Citizens for Beiser on Schedule 16, Political Activities and Lobbying). Ibid. (reporting $53,900 to Greg for Illinois on Schedule 16, Political Activities and Lobbying). AFSCME headquarters, 2014 LM-2 (reporting $100,000 to Kirk Dillard on Schedule 16, Political Activities and Lobbying). AFSCME headquarters, 2017 LM-2 (reporting $26,506,599 on Schedule 16, Political Activities and Lobbying, and $35,037,038 on Schedule 15, Representational Activities); AFSCME headquarters, 2016 LM-2 (reporting $55,286,734 on Schedule 16, Political Activities and Lobbying, and $36,428,456 on Schedule 15, Representational Activities); AFSCME Council 31, 2015 LM-2 (reporting $27,163,272 on Schedule 16, Political Activities and Lobbying, and $39,547,552 on Schedule 15, Representational Activities); AFSCME headquarters, 2014 LM-2 (reporting $64,585,115 on Schedule 16, Political Activities and Lobbying, and $43,443,722 on Schedule 15, Representational Activities); AFSCME headquarters, 2013 LM-2 (reporting $32,249,694 on Schedule 16, Political Activities and Lobbying, and $42,852,060 on Schedule 15, Representational Activities). AFSCME headquarters, 2017 LM-2 (reporting $2,500,000 on Schedule 16, Political Activities and Lobbying); AFSCME headquarters, 2016 LM-2 (reporting $5,359,000 on Schedule 16, Political Activities and Lobbying). See also For Our Future. AFSCME headquarters, 2016 LM-2 (reporting $400,000 on Schedule 16, Political Activities and Lobbying); AFSCME headquarters, 2015 LM-2 (reporting $1,000,000 on Schedule 16, Political Activities and Lobbying); AFSCME headquarters, 2014 LM-2 (reporting $1,000,000 on Schedule 16, Political Activities and Lobbying); AFSCME headquarters, 2013 LM-2 (reporting $1,075,000 on Schedule 16, Political Activities and Lobbying). See also Ballotpedia, “Americans United for Change,” https://ballotpedia.org/Americans_United_for_Change. AFSCME headquarters, 2017 LM-2 (reporting $304,500 on Schedule 16, Political Activities and Lobbying); AFSCME headquarters, 2016 LM-2 (reporting $940,000 on Schedule 16, Political Activities and Lobbying); AFSCME headquarters, 2015 LM-2 (reporting $375,000 on Schedule 16, Political Activities and Lobbying); AFSCME headquarters, 2014 LM-2 (reporting $629,250 to America Votes and $762,000 to various America Votes action funds on Schedule 16, Political Activities and Lobbying); AFSCME headquarters, 2013 LM-2 (reporting $333,333 on Schedule 16, Political Activities and Lobbying). See also America Votes. Anywhere from 39.8 to 43 percent of union households have voted Republican in presidential elections since 2000 according to exit polls cited by Cornell University researchers. See Roper Center for Public Opinion Research, “How groups voted 2016,” Cornell University, (demonstrating 43 percent of union households voted for Republican candidate Donald Trump in 2016); Roper Center for Public Opinion Research, “How groups voted 2012,” Cornell University, (demonstrating 40 percent of union households voted for Republican candidate Mitt Romney in 2012); Roper Center for Public Opinion Research, “How groups voted 2008,” Cornell University, (demonstrating 39 percent of union households voted for Republican candidate John McCain in 2008); Roper Center for Public Opinion Research, “How groups voted 2004,” Cornell University, (demonstrating 40 percent of union households voted for Republican candidate George W. Bush in 2004); Roper Center for Public Opinion Research, “How groups voted 2000,” Cornell University, (demonstrating 37 percent of union households voted for Republican candidate George W. Bush in 2000). Mailee Smith, “U.S. Supreme Court hears oral arguments in labor case centered on Illinois state worker,” Illinois Policy Institute, February 26, 2018.